The ‘Forward Defence’ is the first shot that any cricketer learns in his life! Therefore one can associate it with the best of the best batsmen in the world to the real number 11 batsmen. This is a shot that is played to good length deliveries. Now the question is how do you define a good length? Well that depends on batsmen to batsmen as each batsman has a different or similar height to the other. So one can say that a good length delivery is a ball to which a batsman cannot play a forceful shot all along the ground either of the frontfoot or the backfoot. The only option the batsman has is to allow the ball to come onto the bat and then block it if he has to keep it along the ground. Of course, the big lofted (aerial) shots are played to this length as it allows the batsman a full swing of his arms to get the elevation. In a normal situation, most batsmen take the safer approach in defending the ball on the frontfoot and that is what we are going to show in this episode. Do note that there is no cricket without learning this shot perfectly! The frontfoot defence is a vertical bat shot that is of three types which is because of the three lines of attack that is the offstump, middle stump and the legstump. The first step in any shot not only the forward defence is the first backlift which is done just before the bowler is about to release the ball. The knees are slightly bent to allow the batsman to either transfer his weight on the frontfoot or the backfoot depending on the length of the delivery. The next step would be the second backlift (which differs according to the line of the delivery) and then if it is a good length delivery, the batsman stretches forward to meet the pitch of the delivery and then blocks it. Note that the body weight has to be on the frontfoot in this shot. In a vertical bat shot like a forward defence, the top hand which is the left hand for a right handed batsman holds the bat firm while the bottom hand or the right hand is just for a support and not putting any pressure. Both the bat and the frontpad should come close to each other leaving absolutely no gap for the ball to sneak through! Step 2 : Plant your frontfoot forward and across with the second backlift simultaneously going up and coming towards from the fine leg region. The frontfoot should be bent, toes should face covers/mid off and the head also bent down and watching the ball meet the bat. All this while, the backfoot has to stay intact in the batting crease with the foot parallel to the crease. 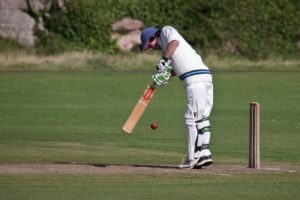 Don’t drag the backfoot out of the crease or there would be chances of getting stumped out if the line of the ball is missed. Step 3 : The bat should come down straight and slightly bent in front of the leading leg to meet the ball to keep it down. The bat has to be bent slightly but at the same time it has to come on top of the bounce. One tip is to allow the ball to do its bit off the wicket and then the bat can meet the ball with soft hands. Step 2 : Plant your frontfoot forward and straight down the middle stump line with the second backlift simultaneously going up and coming from the middle stump. The frontfoot should be bent, toes should facing straight and the head also bent down and watching the ball meet the bat. All this while, the backfoot has to stay intact in the batting crease with the foot parallel to the crease. Don’t drag the backfoot out of the crease or there would be chances of getting stumped out if the line of the ball is missed. Step 2 : Plant your frontfoot forward and pointing towards the line of the legstump with the second backlift simultaneously going up and coming from the thirdman region. For this to happen, the backfoot has to turn on its toe so that the body in turn rotates to get sight of the ball. So essentially the backfoot position in this forward defence is different from the offside and the middle stump forward defences! The frontfoot should be bent, toes should facing towards mid on/mid wicket and the head also bent down and watching the ball meet the bat. All this while, the backfoot has to stay intact in the batting crease resting on the toes. Don’t drag the backfoot out of the crease or there would be chances of getting stumped out if the line of the ball is missed. Here is a doubt raised why do we have to defend a delivery that is on the legstump? When a medium pacer is bowling, a delivery that is on the leg stump can be turned towards the onside with ease using the pace of the bowler. But when a spinner is bowling, its not that easy to turn him towards the onside as there is a tendency of playing too early and therefore it requires lot of skill in working the ball around. Atleast in the longer version of the game, batsmen defend balls that are on the legstump as bowlers try their best to lure them in playing a false shot. Well that’s about it regarding the ‘Forward Defence’. Practice it a lot as it is a must to have!